The term chiral describes a molecule whose arrangement of atoms is such that it cannot be superimposed on its mirror image. If the molecular structure of a substance is chiral, it shows handedness. In this illustration, the right-hand glove is a mirror image of the left-hand glove. In chemistry, chemical structures which are composed of the same atoms but structurally are different form their mirror images are chiral structures. They have the same atoms in the same ratios, but their structures are different. 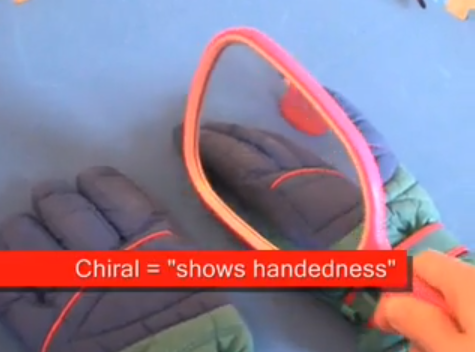 This means that the molecule will show handedness like these gloves. 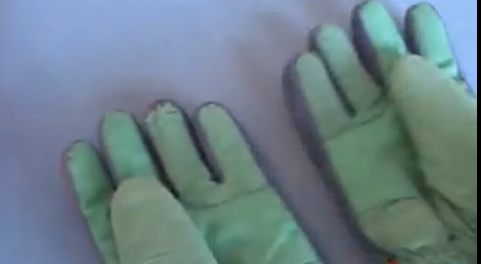 The left handed glove will fit the left hand but not the right hand. The right handed glove will fit the right hand but not the left hand. They are mirror images of each other but they are not identical. They are chiral. They can not be superposed onto each other. This characteristic of chemical compounds is very important in biochemistry and pharmacology. Chemical reactions in biologic systems are catalyzed by large molecules referred to as enzymes. These enzymes may be activated or inactivated by bonding to certain molecules. The drug industry takes advantage of this by manufacturing drugs which may bind to these enzymes for the specific purpose of either activating or inhibiting the action of the enzyme. Other drugs are molecules which bind to locations on certain cells referred to as receptor sites. These receptors control specific biochemical functions in the cell. Many drugs rely on the ability to either turn on (receptor agonist) or to turn off (receptor antagonist) cellular activity wich is governed by the particular receptor site. For the enzyme or receptor site to be activated by a molecule the molecule must “fit” on the enzyme or receptor. This is why chirality is important. In the example imagine the receptor in the shape of a left-handed glove. The left hand can fit the glove perfectly and turn on the receptor. However the right-handed glove cannot fit and cannot turn on the receptor. Here a mirror image is illustrated of a tetrahedral carbon compound with 4 bonds to different atoms. These are chiral compounds. They have the same formula. They differ only in the three-dimensional orientations of the atoms in space which are bound to the central carbon atom. They are mirror images but there is no plane of symmetry. The structures cannot be superimposed on each other. In this image the green and white are superimposed, but the red and blue are opposite. The structures have the same molecular formula but cannot be superimposed on each other. There is no plane of symmetry. They are chiral compounds. 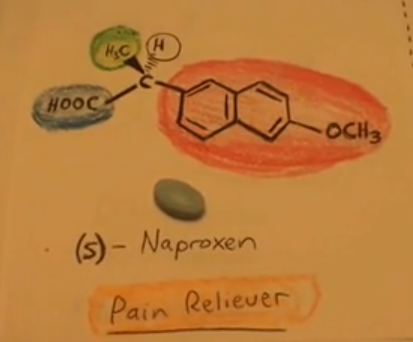 Here is the molecular structure for (S)- naproxen. It is common over-the-counter pain reliever. (S)-naproxen binds to the enzyme cyclooxygenase and inhibits its action in the synthesis of prostaglandins. Decreasing prostaglandin production at the site of injury decreases pain and inflammation. Originally the drug was available as prescription as the brand name Naprosyn. It is now over-the-counter as Aleve and many other generic brands. Only the (S)-naproxen isomer will bind to and inhibit the cyclooxygenase enzyme to decrease prostaglandin production. 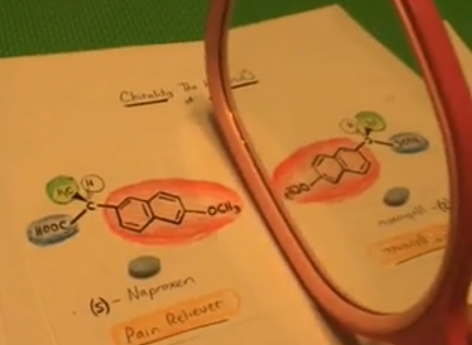 (R)-Naproxen is the mirror image of (S) Naproxen. Although it has the same chemical formula, it’s structure is different. It does not inhibit the cyclooxygenase enzyme and it is toxic to the liver. Here the (R) form is drawn adjacent to the (S) form. Both forms have the same molecular formula, C14H14O3 but are different structurally and this results in different biological effects. The structural difference is due to the different arrangement of groups (H-, H3C-, HOOC-)-surrounding the central carbon stereo-center. (R)- and (S)- naproxen are enantiomers: stereo-isomers are mirror images which are non-superimposable. When a central carbon atom is bound to 4 different groups, switching any two groups will result in another enantiomer. A polarimeter is device which measures the angle of rotation of polarized light which passes through a substance. A polarimeter may be used to determine which enantiomer is present by the direction in which polarized light is rotated when passed through a solution of the substance. The light may be bent counter clockwise (L) or clockwise (R). A very similar compound also used as a pain reliever is Ibuprofen. It is sold as a racemic mixture containing both the (S)- and the (R) enantiomers. (S)-ibuprofen is the active drug and the (R)-ibuprofen is just not active. This “left-handed” isomer of norgestrel is named after its handedness, levonorgestrel or L-norgestrel is named “L” because polarized light passed through a solution containing this form will bend the light counter clockwise (Left). It happens to fit perfectly on and will activate progesterone receptors which are concentrated in target tissues related to reproduction in women. Specifically progesterone receptors are located in the pituitary gland, ovary, uterus, and breast. Normally when progesterone activates these receptors, it signals that an ovum has been released. If the egg is fertilized progesterone will be produced by the placenta until the baby is delivered. When the progesterone receptors are activated, the chemical machinery in the target organs change from stimulating the release of or receiving another ovum, to reactions necessary to support pregnancy and prevent the release of another ovum. This is how the birth control pill works. When norgestrel was originally manufactured, a racemic mixture containing both the left and right-handed components were in the patented drug (Ovral). The right-handed component (dextronorgestrel or D-norgestrel) is harmless but inactive. When the manufacturer discovered how to manufacture the pure left-handed L-norgestrel, they applied for and were awarded another patent for Nordette which contained only the active L-norgestrel. This occurred just as their patent on Ovral (racemic norgestrel) expired. The drug manufacturer very cleverly capitalized on chirality. The “right-handed” norgestrel, D-norgestrel has no medical use but could be drawn exactly as above but all structures coming at you at the carbon stereocenters would be going away and vice versa. In other words, the dotted lines would be replaced by wedges, and the wedges by dotted lines. A chiral carbon is a stereocenter carbon. 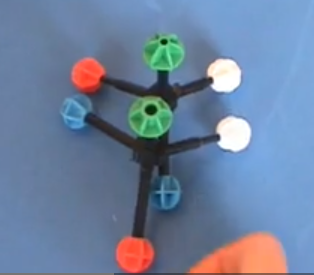 It is a carbon with 4 different groups attached. 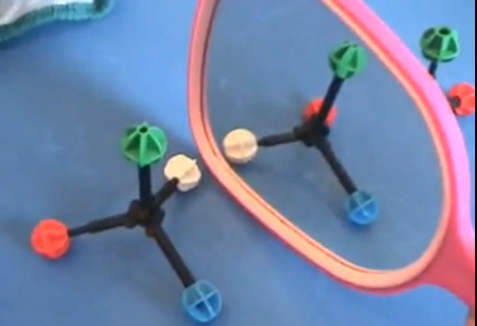 Enantiomers are stereoisomers with non-superimposable mirror images. A stereocenter or stereogenic center is an atom bearing groups that an interchanging of any two groups leads to a stereoisomer. 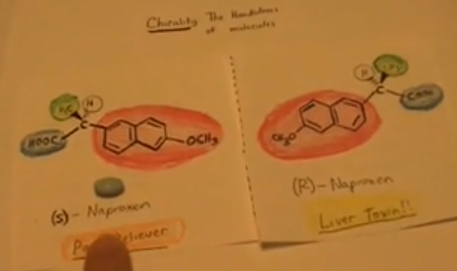 I was reading “Chirality (handedness) of drugs” and i think that your explanation was really excellent. Thats why i would like to know if there is any possibility that you upload the part of the video in which you explain the isomers of Norgestrel, because it was written in the article (by your husband) but it does not appear in the video, and i need to see how to draw the isomer Dextronorgestrel. I was looking in the internet and there is a lot of structures of L-Norgestrel but not of D-Norgestrel. Hint: Use a mirror. D-Norgestrel is the mirror image of L-Norgestrel.